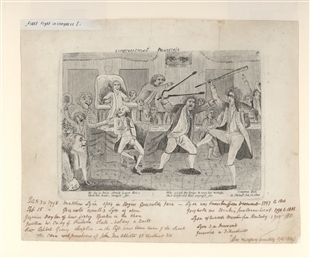 About this object This 1798 cartoon depicts the infamous fight of Connecticut's Roger Griswold and Vermont's Matthew Lyon. France resented America’s 1795 Jay Treaty with England and broke off diplomatic relations with the young country, sparking an undeclared naval war which dominated the 5th Congress (1797–1799). 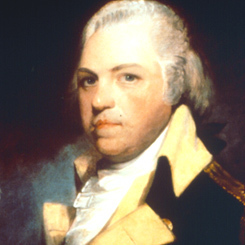 Connecticut’s Roger Griswold and Vermont’s Matthew Lyon brawled on the House Floor after President John Adams recommended that Congress prepare the military while renewing negotiation efforts. When French demands for bribes ended negotiations, Congress established the Navy Department to oversee the fleet, the U.S. Marine Corps, and the draconian Alien and Sedition Acts. 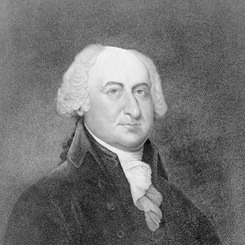 As the Congress ended, President Adams announced another round of negotiations with France. After the House failed to expel Representative Matthew Lyon of Vermont for “gross indecency,” Griswold sought justice by attacking Lyon on the House Floor with a cane. The morning after Christmas Day, the House attended a memorial Joint Session for former President George Washington.